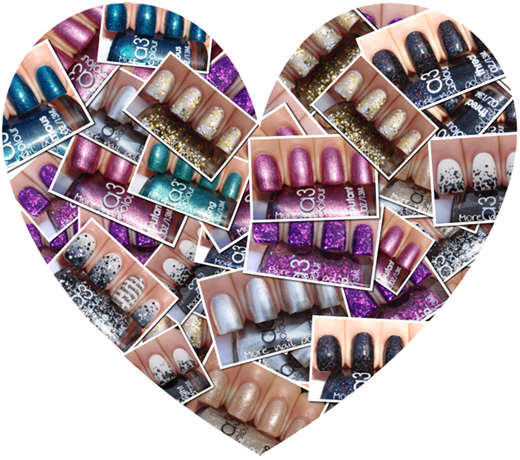 Thanks to everyone for your wonderful entries in my Haiku competition to win the full Glitterati Collection from Ulta3. Now I wasn't very strict with the syllables for the Haiku's, I pretty much considered everyone's entry. This one from Kat Daniels was my winner until an entry on the last day. What I like about this one was the connection it made with me. I made me think of the afternoon I spent with my nail buddies the weekend before last where we painted our nails, gossiped, smiled and laughed. But this one from M that came through on Sunday afternoon touched my heart and is my winner. You see both my mum and I are people that have taken in many a stray kitty at our back door. Sometimes you'd just see a little silver flash of a kitty darting past the back door, after eating the food we put out for them. They often looked so sad with bedraggled fur coats that really were cut to shreds by the cold winds. And the word M chose from the polish collection was "glamourpuss", which reminded me of one of my very kitties as a child "Shelly" whom we always referred to as Grizabella the Glamour cat, in reference to the musical 'Cats'. So you can see why I chose this one as the winner, it was just right for me in so many ways. M - please send me an email with your details so I can post out the package. Please reply within 2 days or I will offer the prize to Kat. Congratulations to everyone who participated - there were so many good Haikus. Extra congratulations to the honorable mentions and of course the winner. Well done!